I’ve been blogging on and off for seven years, now, and I don’t recall this ever happening before, so actually, I jumped at the chance. Very quickly, they put my chosen Kindle light into the post and I got it the following day. Most of the time this isn’t a problem, but when I took the Kindle camping, it was much more so. I turned at first to a book light I had once won in a Christmas cracker years ago, but this suffered four problems: its rough metal clip scratched my precious kindle; the cheap reflector cast irritating shadows all over the page; it was powered by weird unusual batteries; and worst, despite being originally designed for books it was useless for them as you had to keep repositioning it when you switched from recto to verso. 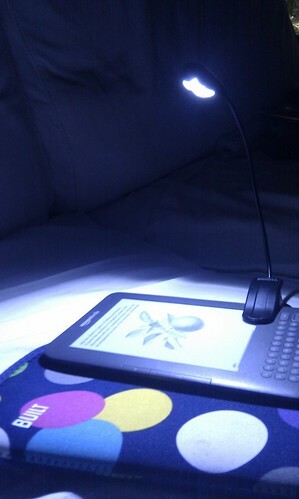 GearZap sent me an XtraFlex2 Kindle Reading Light – and it’s really good. It instantly fixes all the problems I had before. It has a padded clip that will not harm the finish on the gadget. The high-quality lights and reflectors cast a very strong light in exactly the right place, and the gooseneck allows fine tuning to position it properly. The light is almost as bright as my mains powered bedside light, and it will be very good indeed in a tent. Used with actual books, the twin LEDs in the light head are angled to cover both pages of a book without having to move it. And it takes normal AAA batteries that won’t be at all difficult to secure next time I find myself in a tent, getting carried away, and reading all night. And this highlights the one slight problem using this light with a Kindle – the deep clip isn’t quite designed to fit the device (unlike, say, this one, which is clearly intended for exactly this product). It is not an insurmountable problem: you can clip the light enough to work at the top, or you can use the full extent of the clip halfway down as pictured. So, fast delivery, quality product – what more could you want from a supplier of Kindle covers with lights? 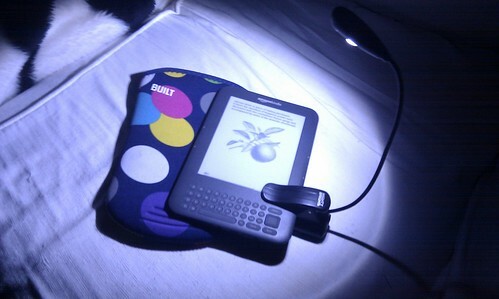 One final point: this type of device, a personal book light, is often sold as a way of letting one of two people who share a bed continuing to read after the other has fallen asleep. This might work for some people, but it doesn’t work for us. I’m the late reader, but P is a light sleeper. Attempting to read in bed wakes him up. I could sleep through earthquakes, so if ever he wanted to read after I fell asleep, I’m sure it would be fine. This entry was posted in Links, Ramblings and tagged freebie.